» Merax Gaming Chairs – Would You Buy One? Merax Gaming Chairs – Would You Buy One? 1 Why Choose A Merax Game Chair? Why Choose A Merax Game Chair? Merax gaming chairs are popular with gamers who are looking for something that is comfortable, looks nice, and is reasonably priced. You can find under $100 and up to the mid $200s. You tend to pay a bit more for the larger sized chairs that have higher weight restrictions. If you are looking for a higher capacity chair we recommend checking out our big and tall gaming chair page. They also come in many different color patterns and styles. 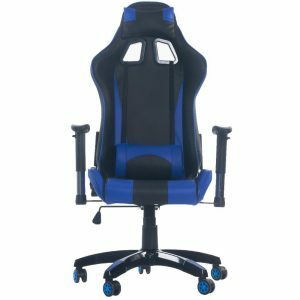 Merax gaming chairs are designed like a seat you would find in a racing car including a high back and portholes and bucket seating. Some of them also come with adjustable pillows and a retractable footrest so you can lay back, put your feet up, and relax. The footrest can also be neatly tucked away by flipping it back and sliding it under the seat. A standard feature in these chairs is their gas lift for setting the height of your seat and a 360-degree swivel for easy mobility. Depending on the style of chair you choose, they come with armrests that are either stationary or adjustable. Another nice quality of Merax gaming chairs is the backrest tilt which allows you to remain reclined wherever you set it without having to keep constant back pressure for the chair to remain in a leaning back position. Not to mention the different tilting degrees for whatever position you want to sit in. You can sit up completely straight, lean back a bit, or lie right down and take a nap. 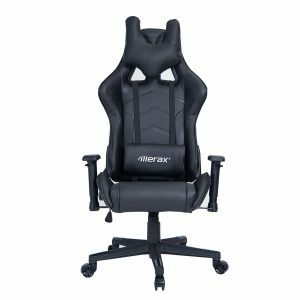 When comparing Merax chairs to other popular gaming chairs like DX Racer, many have claimed to be very happy to find such a quality chair while saving a few dollars. Also when it came to assembly, overall comfort and basic function Merax chairs have excellent feedback from users. In case you were wondering about the Merax brand itself, as a whole, they specialize in a wide range of products including home and office furniture, mobile accessories and more. They not only offer a great variety of budget gaming chairs but also desks that may be a great choice if you are also in the market for a gaming desk that will offer both sturdiness and attractive colors & designs. Find an easy addition to your gaming room or workstation area. Built with smaller to medium spaces in mind. Set individual angle modes to customise your reclining experience to each and every situation. Try all 4 positions for maximum usage. Here is a review list of the types of gaming chairs from Merax that can suit any style or preference. Included are many styles, colours, sizes, and some of these racing chairs have a built-in footrest. Note that most of these Merax chairs share the same high standard hardware components and features like ergonomic design, high backrest, lumbar cushions, racing seat style, 360-degree swivel, and tilt function. Are you looking for support in all the right places while sitting in a chair for long periods of time? The U-Knight has a very uniquely formatted and structured a U-shaped cushion for your head and neck for maximum support and comfort. Comes in seven different colour combinations. ​Signature lightning bolts at the top of the head rest. ​Made of high-quality PU leather is both where is this than an easy to clean. 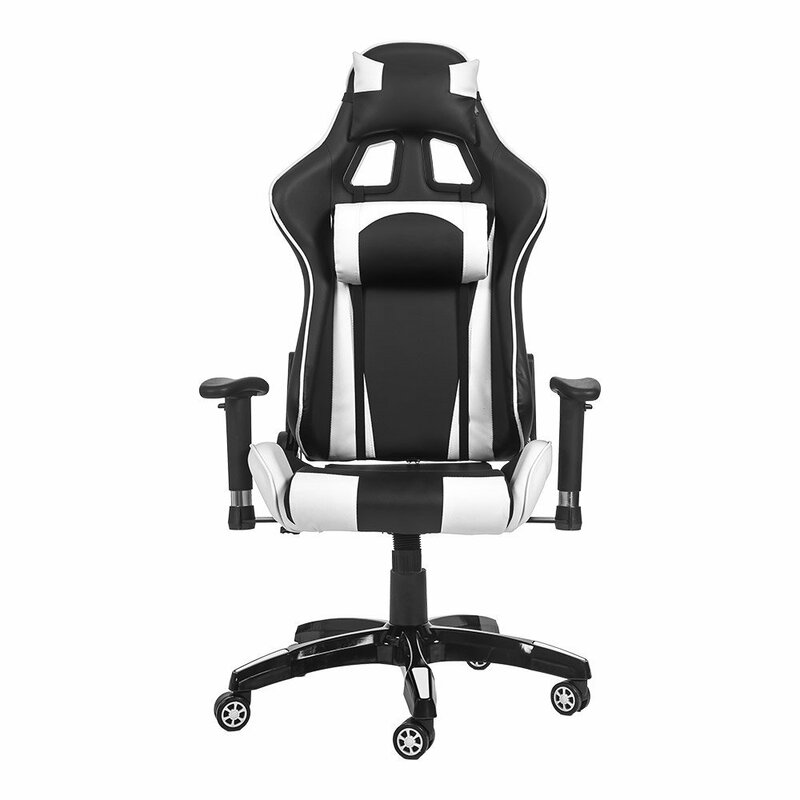 A budget gaming chair that is both comfortable and fairly sturdy. 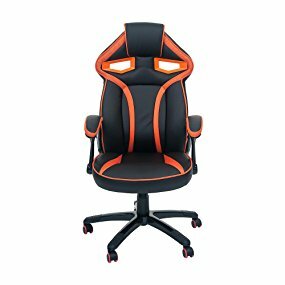 A cheap gaming chair that under $100 dollars. Constructed of PU leather and mesh materials for breathability bits modern design is both visually appealing structurally sound. Comes in five colours including Pacific Blue, Electric Green, Magma Red, Arctic White, and Sunset Orange. ​Height adjustable by means of its gas lift to set according to your personal preferences. ​Ergonomic Arch Bridge padding that is filled with soft dense material for maximum comfort and streamlined design. ​Modern support design focused on the reinforcement of one continuous piece melody and streamlined appearance. This chair may better be suited for those with narrow hips. A mid-range price gaming chair that is designed for durability, style and superb stability. Around the $125 to $200 range based on style, colors, and other factors. Built with a high back will support your spinal column from your lower back to the top of your head. Tilt function that can be set to up to a 180-degree angle. Perfect for laying back and taking a nap. ​Safeguard Recline Locking System allows you to set your backrest angle in the desired position as well as allow you a rocking function. ​Ergonomically designed with a curved backrest and spacious cushioning comfortable stationary for longer periods of time. ​Adjustable armrest both in height as well as direction providing more room to spread out. ​Removable Headrest and Lumbar cushion. If you prefer the extra support you can use or one of the other ornate neither of these two supporting cushions to help your back to get more support. 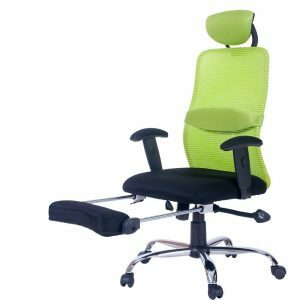 Here is a very budget friendly chair that provides yet another look from Merax that offers similar benefits to other low budget chairs are known for. A fantastic option for those who are in the market for a reclining mesh office chair for their gaming and workspace needs. These chairs also allow you to put your feet up the built-in slide out footrest. Contoured SU-shaped backrest with mesh backrest for gently suspending your back with its ergonomic design while helping you remain cooler in comparison to leather or full fabric chairs. ​Adjustable headrest for supporting your head perfectly when you lay back. Slide out foot rest for putting your feet up for greater relaxation. Lightweight and very easy to move around. Hopefully, you have learned enough about Merax gaming chairs to make a more educated decision. Keep in mind that these are classified as budget gaming chairs, so they may not be compared to more expensive chairs. However, there are a lot of nice features about these chairs that are definitely worth considering.